There are many Yoga studios in city of Geneva practising Yoga of various styles and for differend kinds of people. Have a look on our brief listing of most popular yoga studios and choose the one that suits You best! Updated in summer 2015. 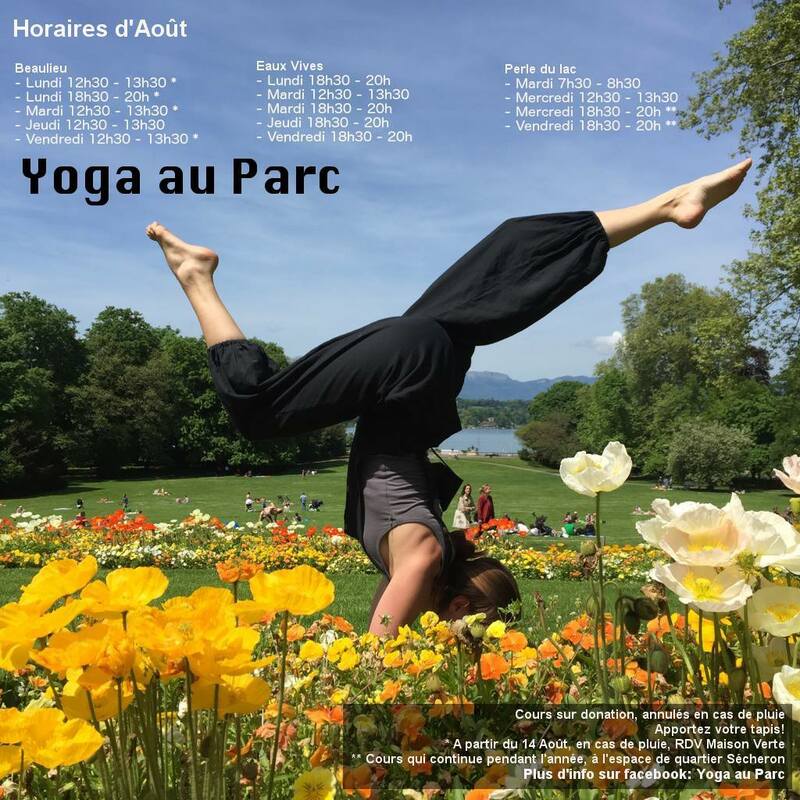 Several Yoga teachers from Geneva are teaming up this summer (2015) to offer donation based classes in 3 parks of the city: Eaux vives, Beaulieu, and Perle du Lac. Daniel, an amazing warm-hearted certified yoga instructor with a 10 years of experiences in teaching yoga. He leads the public evening classes in Hatha and Acro Yoga in two different places in Geneva. His teaching techniques are very specific and intuitive, focused on every single person. Regular hatha yoga classes are held on Mondays (7 pm - 8.30 pm) and Tuesdays (6.30 pm - 8 pm, 8.15 pm - 9.30 pm) in his own place in Petit Lancy and on Wednesdays (7.30 - 9 pm) in a hosting studio Arts Therra in Servette, next to Gare Cornavin. In Servette, Daniel does also the Acro Yoga classes every Sunday from 6.30 pm until 8.30 pm. The prices varies from 20 CHF per class in Petit Lancy to 30 CHF per class at Arts Therra. If you are a company or a school, Daniel is a right teacher for Your workers or students, as he is providing the classes for groups and international companies such as UN or for few banks in Geneva. In addition to yoga, Daniel is well experienced Thai massager, an osteopath, Cranio Sacral Therapist, who has done his studies in different places all over the world, including Spain, Bali, Thailand. If you are looking for a wonderful very intuitive, relaxing and refreshing Thai or flying therapeutic massage with Daniel, do not hesitate to contact him. He provides massages at his studio from 60 to 200 CHF or at your home with an extra price 30 CHF in Geneva or in Gland once a week. The classes and massages are hold the whole year, except of summer break in July and August. L'Espace EKA is a great space to discover as it's an association, offering regular yoga classes as well as other activities and workshops from time to time (ie. cooking, massage, improvisation, etc!). Three sympatic ladies, certified yoga teachers are leading classes specially for adults, for children, for pregnant women as well as for new mums. Yoga classes are affordable as far as yoga in Geneva goes and 2 classes a week are on a donation-basis: Thursday class at 17h45 and the Saturday class at 11am with Kasey, who teaches Vinyasa flow; as well as many of the weekend workshops and activities that take place here. Price (usual): 25 CHF for adults, 15 CHF for students, unemployed, children. First class: 12 CHF for adults, 7 CHF reduced fee. One month card is 100CHF (80CHF reduced fee). The classes are held usually during the year until the middle of July when the space will close for the summer break. Yoga mats and other materials are provided. If you are a beginner or pregnant women, looking for a traditional hatha yoga from India, Yoga Veda is the right place for you. Nadia Plagnard is not only a certified yoga teacher, but one of few succesful midwifes in Geneva, an ayurvedic masseuse and Reiki practitioner. Mainly focused on women, Nadia offers prenatal, postnatal yoga and yoga for women. Her classes are held in a very peaceful and traditional way, with a lot of meditation. Slowly, but precise exercises of asanas allows you to harmonize and relax your physical body and all its systems, prevent from stress, pains, migraines and many other problems. Regular prenatal and postnatal classes are held twice a week, in french or english language. On demands, Nadia organises hatha yoga classes for everybody on Fridays. For more information about classes, please visit a website or contact Nadia. On 29th of June 2014, Nadia has a Yoga Workshop in the parc La Perle du Lac, close to the Hotel Wilson. It will be a special yoga class for everybody, where you can bring your family and kids. Price for adults: 30 CHF, reduced price: 20 CHF, free for children under 12 years. The Sivananda Yoga Centre in Geneva is one of many Sivananda centres spread all over the world. The centre in Geneva has more than 30 years of experince in teaching classical hatha yoga and spreading its philosophy and techniques. Offering people various beginner's, intermediate or intensive courses starting every month, as well as yoga workshops and free meditation sessions. There are also prenatal yoga classes (Tuesdays) and yoga for children (Fridays) in the centre. Classes are usually based on teaching 12 basic postures, breathing exercies, relaxation and practising Sun Salutation. If you are new to yoga and would like to know more about its philosophy and the Sivananda centre, come to the next Open Day, which is held usually once a month, free of charge. Every Monday are offered also free trial classes at 8 pm, where booking is not needed. For those who work at UN or have a acces to the Palais des Nations, the Sivananda Centre offers you classes at UN on Mondays and Thursdays. AOM community (Aura One Movement) offers you regular different types of yoga classes in Geneva. You can choose between Heart Hatha yoga, Heart flow yoga, Ashtanga yoga or Vinyasa yoga. Classes are taught daily in Jonction or in Eaux-Vives, in french or in english (depends on the date). Some classes are designated for beginners, some for advanced students, some for boths. For a weekly schedule, check the website. Prices varies according to the weekly schedule, or offered packages (for more information please visit a website). AOM offers you twice a week donation based classes open to all students . All donations from these classes supports social projects of AOM community. Classes based donations are held in english at Jonction. Vinyasa Yoga class is on Tuesday from 6 pm to 7:30 pm and on Thursday is Hatha Yoga class from 7:30 pm to 9:00 pm.